Our reporter from The Youth Paper asked Mr.
Carter about the youths role in making peace. Two important events were our main goals in the capital today. 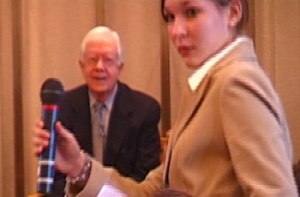 The first one was the press conference with Nobel Peace Prize laureate Jimmy Carter, at the Norwegian Nobel Institute. Despite very tight security, two of our students were accredited along with a host of journalists representing newspapers, and tv and radio stations from many countries. It’s often hard to get the chance to ask the laureate any question at the press conference. Many journalists want to, but the time is limited. However our reporter from The Youth Paper got the nod from Geir Lundestad, the secretary of the Nobel Committee. And our student was well prepared..
A visit to the Norwegian Parliament – Stortinget – was our second main goal . It all started with a guided tour of the Parliament building. On the tour we got information about the Parliament’s history, it’s members, administration and the Norwegian political system. After the tour we had a meeting with former Norwegian Prime Minister, Torbjørn Jagland. He is currently chairman of the Standing Committee on Foreign Affairs and the Enlarged Foreign Affairs Committee. In half an hour we were able to ask him questions covering numerous topics. However Jimmy Carter and The Nobel Peace Prize was the main topic. We also got the chance to meet MP Knut Storberget. Member of the Storting since 2001. Many questions had been prepared for the two well known politicians..
Torbjørn Jagland and two of our students.